Josephine Tsai grew up in Taiwan where she was exposed to the richness of Chinese culture. After immigrating to the United States in 1980, she lives in Media , Pennsylvania , where she is an active participant in the Delaware Valley community. As one of the founders of the Chinese Brush Painters and Calligraphers Society , Josephine devotes much of her time to studying, sharing and practicing Chinese art. 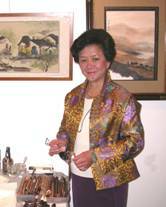 Besides participating in shows and holding individual art exhibits, she brings Chinese culture and art to many schools in the community and teaches Chinese brush painting at Darlington Fine Arts Center , Community Arts Center , On Lok Senior Center in Philadelphia, and her own Dancing Brush Studio. In 2006, she held a solo exhibit at the Waterfall Gallery near Media PA. She gave demonstrations at the Longwood Garden Chrysanthemum Festival, and won a First Place Award at the Rose Tree Art Show in both 2002 and 2004, honorable mention in 2006 and Third place award in 2007, won first place award at 2008 Media Art Show.